Wicall’s Carpets & Flooring has a wide range of options to choose from and right now we’re offering Alterna by Armstrong Luxury Alterna flooring options at great prices! We also offer several other top brands of flooring at amazing prices. Come get the Luck of the Irish this weekend. Wicall’s also has some colorful area rugs that can add spice to any room. Imagine how a bright purple and gold run could accent that dining room or family room! And Wicall’s Carpets & Flooring has a variety of area rugs ON SALE right now that are striking and won’t break the bank. So you need to come in and check out our expansive showroom at 26635 Valley Center Dr. in Santa Clarita and see what we have to offer. 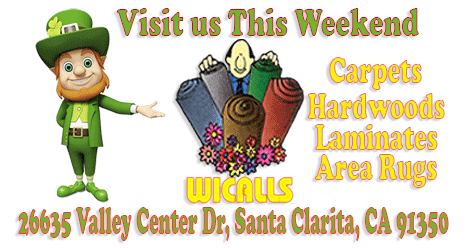 Wicall’s Carpets & Flooring www.wicallscarpets.com has just the flooring you’re looking for – stop in and check out our showroom at 26635 Valley Center Dr. in Santa Clarita or call us at 661-259-6040. Few things can accent a home as much as new carpeting or hardwood flooring. 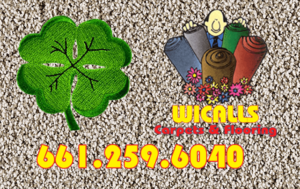 Wicall’s offers more than superior carpeting. We also offer high-quality vinyl, ceramic and hardwood flooring. You can view a sample of all the available options online or in the showroom so you can determine which type will work best in your home. Wicall’s provides assistance with measurements and installation once you choose your favorite products. We have customers who have looked all over and nearly given up before they set foot in Wicall’s. But when they saw our amazing selection of carpet, hardwood, laminate and vinyl planking… well, they definitely found what they were looking for! Come and check out the showroom inventory and choose the pieces that suit your home best. You are sure to find flooring that matches your color scheme and furniture perfectly. Looking forward to serving Santa Clarita!! !